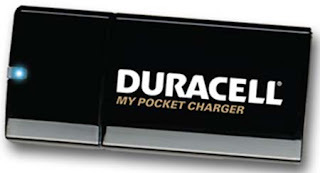 Duracell Launches Portable Mobile Charger - My Pocket Charger ! You may have seen tooiphone-3g-travel-charger-makes-you-happy/"> many chargers in our blog and somewhere else. Still this is a new one which can make you stress free of remembering every time to take along with you. The name of the charger is iphone-3g-travel-charger-makes-you-happy/">My Pocket Charger works as a Power Source Mini portable charger, which is a portable one, comes from Duracell. There are two AA batteries available in this smaller My Pocket Charger for solar-electric-sports-car-rocks-from-koenigsegg-quant/">power source. You can have two versions in this solar-power-mobile-charger-works-even-in-city-buses/">portable charger respectively for iPod and BlackBerry. The charger for BlackBerry can be used for motorola-launches-its-jewel-like-mobile-u9/">Motorola too. You have to pay $16.96 for iPod version and $14.96 for free-weather-watching-software-is-ready-for-the-blackberry-storm/">BlackBerry version.